I ate a lot of this soup when I was a child and I loved it with copious amounts of pepper. When I moved out of home, I learnt to make it by using the pre-made stocks that you find in the supermarket but over the years I started to realise I could make a basic stock with fresh chicken. There’s no waste because the bones are used for the stock and then the meat is added back into the soup. First time I had this with rice was in a restaurant and I was cringing when my friend started ladling soup over rice. When it was my turn to dig in, that first spoonful of rice and soup locked into my food memories. When I have to cook for a large group of people, I make a big of pot of this. Place chicken drumsticks in a large pot and cover with water. Place lid on the pot and bring the water to a gentle boil before reducing the heat and simmering the drumsticks for approximately 15-20 minutes or till the meat is just cooked. Remove the drumsticks from the pot and set aside to cool. Skim the stock to remove scum and impurities. Once the chicken is cool enough, remove the skin and strip the meat off the bones. You can slice the chicken up or just two forks and shred the meat. Return the bones to the soup and simmer for 30 minutes. Remove the bones and season the stock lightly with salt. 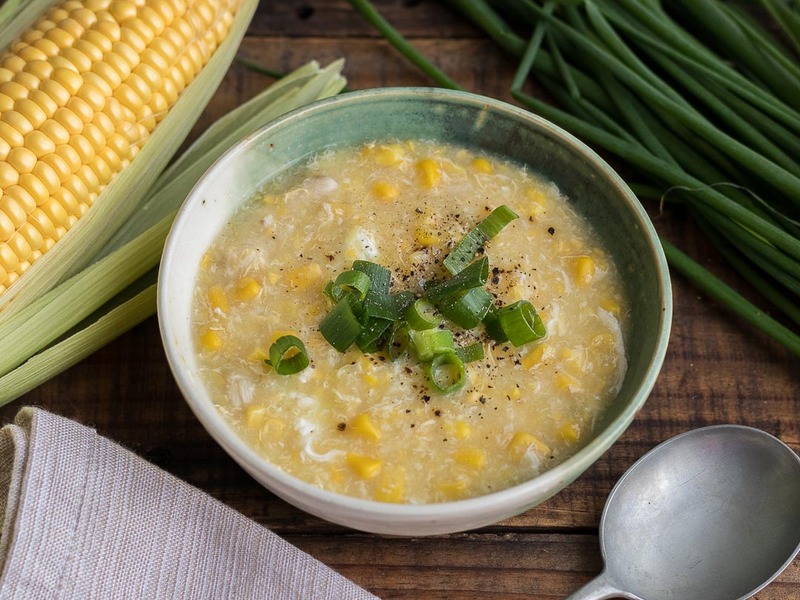 Add the canned corn and bring the soup to a simmer. Return the chicken meat to the soup. Place one tablespoon of cornstarch into a small bowl and add a few tablespoons of liquid from the soup to dissolve the cornstarch. Pour this mixture into the soup and stir well and wait to see if the soup thickens up to your liking. If the soup seems too liquidy, repeat with another tablespoon of cornstarch. Don’t add the cornstarch directly to the soup without dissolving it first, it’ll just form clumps. Lightly beat two eggs in a bowl and stir the soup as you pour the eggs into the pot. Taste and season with salt. To serve the soup, ladle into bowls and sprinkle cracked pepper and spring onions on top.